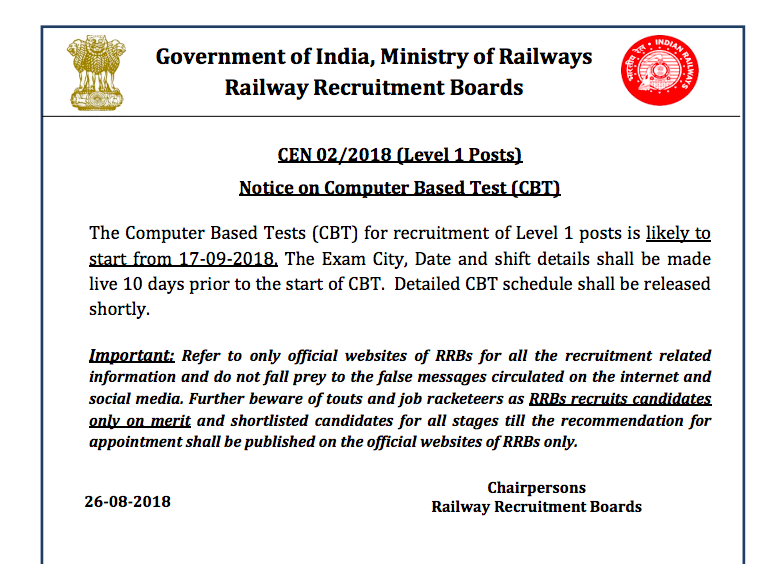 The Computer Based Tests (CBT) for recruitment of Level 1 posts is likely to start from 17-09-2018. The Exam City, Date and shift details shall be made live 10 days prior to the start of CBT. Detailed CBT schedule shall be released shortly. Important: Refer to only official websites of RRBs for all the recruitment related information and do not fall prey to the false messages circulated on the internet and social media. Further, beware of touts and job racketeers as RRBs recruits candidates only on merit and shortlisted candidates for all stages till the recommendation for appointment shall be published on the official websites of RRBs only.